parAnkusa nAyaki requests a few kurugu (heron/stork/pelican) birds to relay back emperumAn‘s reply after telling him that if he does not protect her, his nArAyaNathvam which includes protecting everyone will become questionable. Subsequently, parAnkusa nAyaki requests a young kurugu which has a small body which makes it easy to travel (far), to go to emperumAn who is sarvarakhsakan (protector of all) to inform about her. parAnkusa nAyaki says (to emperumAn) “Forget about us who are going to die any way; But you are trying to live – Don’t you want to save yourself?”. She tells (the kurugu) to inform emperumAn to preserve his title of nArAyaNathvam (being the protector of all). Oh young kurugu who searches for prey in gardens which have abundance of water and who is pleasing to eyes! when you see emperumAn who has exclusive relationship with everyone to protect them and who with great desire himself removes the hurdles and fulfills the desires of the (people in the) worlds without them expecting so, you give him the message taken from me who is with tearful eyes. nArAyaNan indicates antharyAmithvam (being the in-dwelling super-soul of everyone) and samudhrasAyithvam (lying down in the causal ocean). As said in thiruvAimozhi 8.10.3 “siRu mA manisar” (AchAryas with small form but great characteristics), AchAryas forms being small is highlighted. AzhwAr says to some kurugus to inform emperumAn “bhagavAn who is most merciful, forgives the offenses of all jIvAthmAs, removes what is unfavourable for them and protect them in a friendly manner. Why can’t he forgive my mistakes and accept me and mingle with me?” and requests them to get the response from him. nalgi – While protecting his vibhUthi (wealth), instead of doing it as a duty, he does it as a desirable result for himself. Just like I have so much attachment towards emperumAn, he has so much attachment towards his subjects. thAn – without them expecting, he himself is going and protecting them. pozhil Ezhum – pozhil generally means bhUmi. Here it is indicates all 14 layers where the 7th layer from the top-down is Earth. It can also indicate Earth which has seven islands. nalgiththAn kAththaLikkum … – nalgi – Since all of these worlds are considered as emperumAn‘s body, just like one will take care of his body with great desire, emperumAn too takes care of these worlds with great care. nalgi means snEham (with desire) as well as srushti (creation). When the entire creation was in subtle state, who requested him to transform it to gross/manifested state (these worlds, etc)? It was out of his own desire he does these. “kAththu” and “aLikkum” both mean protection – these are explained in context of the two meanings of nalgi. When nalgi is considered as snEham – kAththu means anishta nivruththi (removing the unfavourable aspects) and aLikkum means ishta prApthi (fulfilling the favourable aspects). When nalgi is considered as srushti – After creating the worlds, emperumAn sustains them and also consumes them in the end to protect them safely. Here kAththu means samhAram (where he protects everything by absorbing them within himself) and aLikkum means sthithi (sustenance). vinaiyERkE nalgaththAnAgAthO – (nalgi – srushti) When the worlds were not present (they were in subtle state), you created them. But after creating, we start accumulating karma (good and bad) – should you give up on us citing such karma? (nalgi – snEham) Should you not protect your dependents? When you are protecting everyone, why not protect your spouse (me) as well? nAraNanaik kaNdakkAl – He is the ultimate controller of the existence, etc., of all jIvAthmAs. 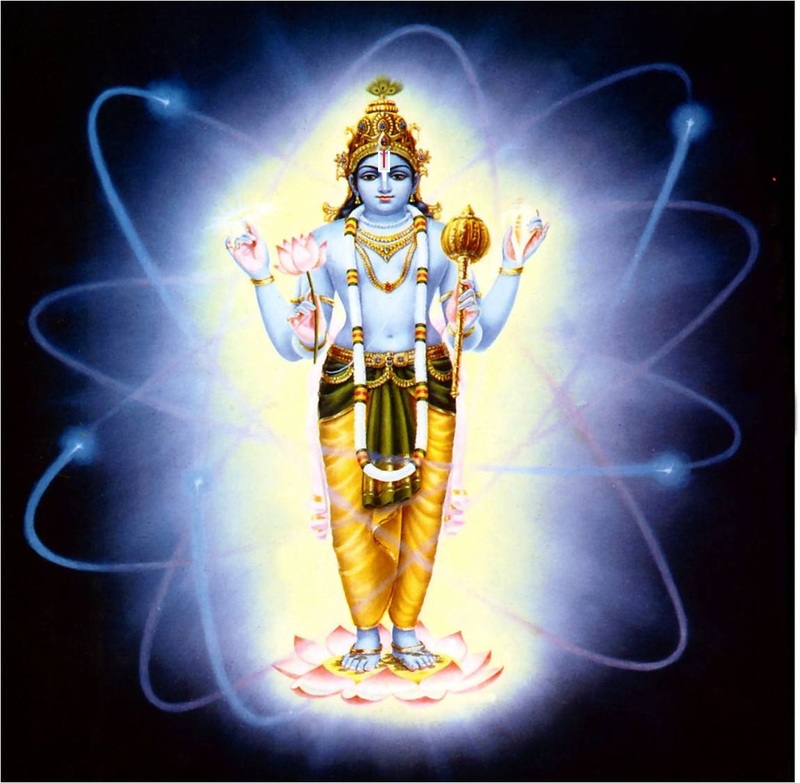 He is the prakAri (substratum) and everything else is prakAram (attributes/forms). Even if one AthmA is not protected, it a loss to him. This is the meaning of the title “nArAyaNa”. Go and ask him “We thought this name referred to you as per yaugika (etymological meaning) as well as rUdi (general prevalence). But, is this is like cactus having the name ‘mahAvruksha’ (great tree – when it is really neither huge nor useful)?” [The name nArAyaNa is asAdhAraNa (most-distinct) and is only applicable for srIman nArAyaNan or vishNu – no other dhEvathA can claim that name, because only emperumAn fulfills both yaugika and rUdi principles. For example: mahEshwara indicates rudhran by rUdi (general prevalence), but srIman nArAyaNan by yaugika (etymological meaning) since he is the only supreme controller]. irai thEr – Searching for a prey that is suitable for the female companion. Like its said in periya thirumozhi 5.1.2 “puLLup piLLaikku irai thEdum” (searching for fishes to feed the child bird) – though big fishes are passing by, its waiting for small fishes that will fit in the child’s mouth. vaN siRu kurugE – kurugu is vaNdAnam or koyyadinArai (types of stork). vaNmai – beauty, generosity. You are generous unlike emperumAn who is feasting (enjoying) while I am starving (suffering) here in separation. Hopefully, your are not like him. malgu nIrk kaNNERku – My eyes are also filled with water (tears) and they look like beautiful fishes (which attract storks). Teary eyes is parAnkusa nAyaki‘s identity it seems. While being together, her eyes are filled with joyful tears and in separation they are filled with sorrowful tears. Or vAsakam koNdu – Just pass my message to him. parAnkusa nAyaki is fearful of emperumAn rejecting him. But she just wants a reply from him – whether it is yes or no. In siRiya thirumadal, thirumangai AzhwAr says “thArAn tharum enRu iraNdaththil onRathanai” (he will say yes or no – either way). ANdAL says in nAchchiyAr thirumozhi 13.9 “meymmai solli mukam nOkki vidaithAn tharumEl miga nanRu” (Even if looks at me and says “I dont want you”, that is very much acceptable – at least at that time he will look at me and I will try to convince him in other ways). nammAzhwAr himself says in thiruvAimozhi 4.7.3 “pAvi nI enRu onRu sollAy” (Even if you accuse me as a sinner – just open your mouth and speak to me something). aruLAyE – bless me – When she considers herself as sIthA pirAtti, these birds as her messenger and the result they bring is bhagavath vishayam, then she has to speak to these birds respectfully. bhattar was informed “nambi ERuthiruvudaiyAn dhAsar thirunAttukku nadanthAr” (nambi ERuthiruvudaiyAn dhAsar left/walked to paramapadham). He was startled and then replied “avar srIvaishNavargaLudan parimARumpadikku, thirunAttukku ezhuntaruLinAr ennavENum kAN” (for the way he interacted with other srIvaishNavas, you should say ‘he ascended to paramapadham’ in a respectable way) [srIvaishNavas should speak to other srIvaishNavas with great respect/reverence irrespective of their age, birth, wealth, intelligence, etc]. This entry was posted in thiruvAimozhi, thiruvAimozhi 1st centum on July 19, 2015 by Sarathy Thothathri.